WASHINGTON — Veterans Affairs Secretary David Shulkin had arguably the most successful year of anyone in President Donald Trump’s Cabinet, with frequent praise from lawmakers, veterans groups and the West Wing. So it was a jarring moment this week at a routine Senate Veterans’ Affairs Committee hearing when a Republican senator called him a habitual liar. “I think you tell me one thing and you tell others something else,” said Sen. Jerry Moran, R-Kan., adding that he blamed “your ability to speak out of both sides of your mouth, double-talk” for recent disagreements on veterans policy in the chamber. The moment caught Shulkin and several members of the audience off guard, but not other panel members. Several offered their own complaints about unfulfilled promises in recent months. The committee also took the unusual step of swearing in Shulkin as a witness, a move that seemed unimportant at the time but loomed large after Moran’s accusations. The secretary downplayed the incident afterwards, insisting he wasn’t blindsided by the criticism. “The job of the Senate is to provide oversight, and if there are concerns, I want them to share them,” he said. But the conflict underscored a message from committee chairman Sen. Johnny Isakson, R-Ga., at the start of the hearing. After lauding Shulkin’s successes in his first year on the job and complimenting him as a “forthright leader,” he also hinted that goodwill won’t guarantee an easy year two. Among Trump’s inner circle of executive branch appointees, Shulkin is the lone holdover from former President Barack Obama’s administration. And yet despite Trump’s stated animosity towards all things Obama, Shulkin also appears to be one of Trump’s most trusted Cabinet members. Shulkin has been much more of a fixture at the White House than his predecessors, attending a host of military and health care meetings beyond the expected veteran policy events. Trump smiles whenever he mentions that Shulkin was confirmed 100-0 by the Senate (a replica of that Senate vote hangs on his VA office wall next to pictures of him with Trump). Three times the VA secretary has briefed reporters in the press room, a duty normally reserved for more prominent Cabinet posts. At Shulkin’s suggestion, Trump hosted an August briefing on VA telehealth — an issue that in the past may not have warranted even a White House press release — just a few feet away from the Oval Office. And Shulkin’s VA has been a steady stream of good news for a Trump administration besieged by controversy. Nine major pieces of veterans legislation passed through Congress last year, including new firing authorities for department workers that Republican supporters have coveted for years. 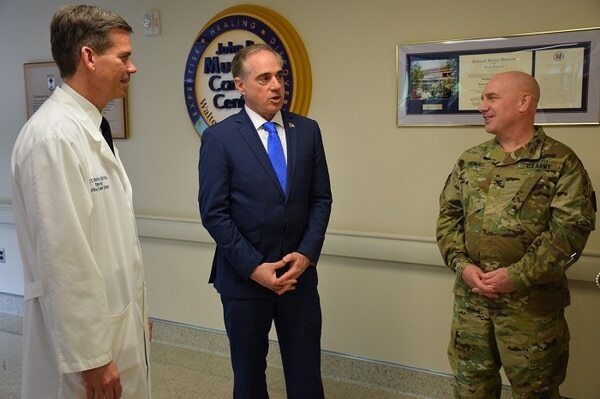 Shulkin has made aggressive moves to align VA electronic medical records with Defense Department systems, to publicly post more information on VA operations, and to extend some emergency care services to veterans previously barred from department medical centers. He also spearheaded Trump’s promised veterans complaints line, taking the campaign promise even further by working to have it staffed entirely by veterans. At an event earlier this month focusing on preventing veteran suicide, Trump hailed Shulkin’s “tremendous strides” in reforming a department he has often called broken and hopeless. In an interview with Military Times, Shulkin credited Trump as the impetus for change. He said he has tried to copy his own leadership practices after Trump’s. But while hailing the work so far, Shulkin only gave himself a grade of incomplete for the progress of the past year. The biggest unfinished piece of business for Shulkin is also the one that he was hired specifically to tackle: overhauling the VA’s health care system. The Veterans Health Administration currently boasts more than 1,700 medical facilities and about 8 million patients nationwide, yet for years has been attacked by critics for being inadequate to cover the medical needs of veterans. In 2014, after a scandal over patient wait times lead to the resignation of then VA Secretary Eric Shinseki, Republican lawmakers stepped up efforts to solve access problems at the department by allowing more care outside those federal medical centers. That brought the formation of the controversial VA Choice program, which conservatives have decried as still too restrictive for patients and Democrats have labeled the first step towards privatizing government responsibilities in veterans health care. Trump was in the former group, declaring on the campaign trail in 2016 that veterans should have a freer hand in choosing which doctors they want to see. Shulkin’s job has been to bring that idea to reality. VA in recent months has proposed an expanding network of federal facilities and private-sector practices with easier eligibility criteria, easier payments for outside physicians and easier funding lines to keep the program operational. Lawmakers from both parties have signed on to parts of the plan in recent months, but it remains stalled in both chambers. 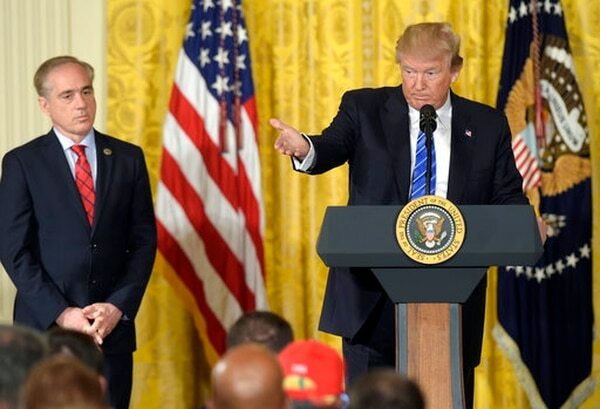 “Everything I am doing is trying to strengthen the VA system,” Shulkin said, repeating his promise that the steps are not designed to privatize VA. “I think the way to do strengthen the system and fulfill your mission is by working closely with the private sector. 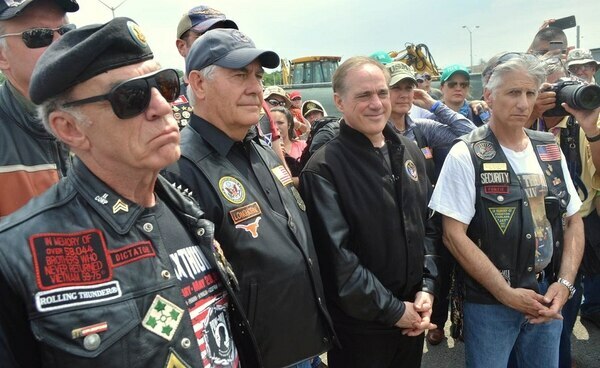 Secretary of State Rex Tillerson (second from left) and VA Secretary David Shulkin (third from left) listen to pre-event instructions before the Rolling Thunder Memorial Day weekend rally on May 28, 2017. (Rob Wilkins/Staff). Moran believes the health care overhaul would move quicker, if Shulkin would be more honest about his positions on the reforms. Last year, Moran objected to Senate Veterans’ Affairs Committee legislation to create a new community care program over concerns that the new rules left too much power with VA, and not with patients. He insists that behind closed doors Shulkin agreed with him. Committee leadership said Shulkin told them he was comfortable with the eligibility limits that Democratic members had endorsed. The confusion prompted Isakson over the winter break to reach out to the White House for clarification on administration positions. A formal response — one that Shulkin will have a role in crafting — is expected in coming weeks. While the tension is the most jarring to date between the VA Secretary and Congress, it’s not the first. Last summer, when White House officials suggested cutting an unemployment benefit for elderly veterans to save money, lawmakers complained they were blindsided by the suggestion. Shuklin withdrew the plan, acknowledging it as a mistake. Veterans groups have publicly praised the secretary for his openness but also quietly complained that his closed-room promises don’t always match up with public testimony answers. A recent change on marijuana policy, allowing doctors to discuss drug use with patients, was hailed as a major shift in private meetings with advocates but dismissed as non-news by VA spokespeople afterwards. Even the suicide prevention event at the White House earlier this month caused minor controversy in the community. VA officials knew Trump was planning on addressing the issue with a new executive action. Lawmakers and key veterans leaders found out about it from the press a few hours in advance, and questioned why they were kept in the dark. When asked about the conflicts, Shulkin blamed the problems on ambition, not apathy towards other stakeholders. “When you are moving quickly, and you’re trying to create change and transformation … you often are moving quickly and make some mistakes,” he said. “I think anyone who has done a start up company or been involved in a major turn-around understands that risk. “You sometimes need to fail at some things in order to accomplish your goal. There is no doubt that where we have done that, where we have moved fast and made potential mistakes, and our colleagues at the veterans service organizations have pointed it out. Those mostly hidden conflicts haven’t stopped Shulkin from getting legislative wins. Even with all the problems and unanswered questions surrounding community care for veterans, Shulkin twice convinced lawmakers to approve big extensions of the existing Choice program, totaling more than $4.2 billion. And after this week’s tense hearing, Iskason downplayed potential problems with Shulkin’s leadership style. But Shulkin noted that for all the successes of the past year, his department still has a host of unfinished work. He knows he’ll be judged on whether those promises are fulfilled moving ahead. A department report on implementation of sweeping new education reforms is due in early March. Nominees for a pair of top department leadership positions should be announced in early February. New reforms to benefits appeals cases won’t be fully implemented until 2019, but Shulkin this week promised veterans should start seeing improvements well before then. Money for the current community care program is expected to run out sometime this spring. Shulkin and lawmakers are hopeful they’ll have a replacement by then. But they were also hopeful last fall, before talks stalled and they had to pass emergency funding just before Christmas. Shulkin insists that he’s not frustrated by that. Just impatient.